There are only so many hours in a day and so many of those are taken up with eating and sleeping. When the mood strikes, um excuse me... the muse strikes, you must write. For the first time in three years, it appears my muse and NaNoWriMo have struck at the same time. I might be a little crazy for tackling a writing challenge this big right now. I am currently in my last semester of my bachelor's degree. I have several projects due at the end of November that are very involved. Yet, when you have to write there is no stopping the urge to write. ready to go and even created a book cover. Possibly a little 'cart before the horse' mentality there but it is motivation. In addition, I have 30 themed prompts that co-relate to my story in case I get stuck. In writing out my outline I have prompted each chapter so that if I get stuck on one, I can move to another. Obviously i plan on editing after the month is over. That is key, edit AFTER the month is over. 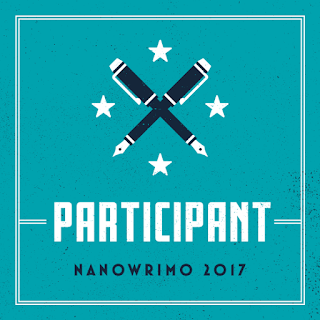 Are you participating in NaNoWriMo? Do you know what NaNo is? 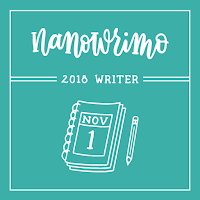 You can learn more about NaNoWriMo here.